There’s an interesting Christmas tradeoff as you move through life. When Santa rules the day (i.e. the kids are young), the stress is high leading up to the big day. Are there enough gifts? Have we visited enough Santa’s? Have all the rituals, I mean traditions, been served? By the time Christmas arrives, you’re exhausted….and then you have to get up at 5 am to start opening presents. But the delight the kinds exhibit is precious and almost makes it all worthwhile. When your kids are 19 and 15, the stress is much lower. There’s no “magic” to be preserved, although there are traditions. It remains a special time of year, but in a more authentic way. And you get to sleep in. Our day has been relaxed and very pleasant. We attended midnight Mass at St. Anselm’s Abbey, stayed briefly for cookies and to wish the monks a Merry Christmas. We didn’t get to bed until 2 am and I was up at 7. The kids got up at 11. We opened gifts and everyone came away happy. Now, we’re just gliding through the day. Notwithstanding all the pleasantness, it is a very different Christmas, the first without my mother and without Rita’s Aunt Gen. We won’t feel the full brunt of their absence until with get up to Boston tomorrow. My mother and Gen were true lovers of Christmas and there will be a big empty place in this holiday season. 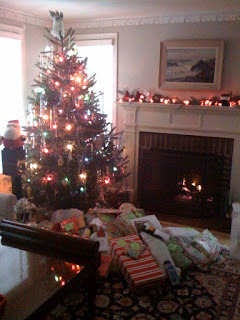 Also, this is the first Christmas in which we won’t be staying in the attic room in Rita’s mother’s house in Brookline. Year after year, I would chafe at the confined quarters and wish we could stay in a hotel. Admittedly less so in recent years as Rita and I have learned to accommodate each other’s needs during this annual pilgrimage. But I have to say, I will miss the old house and will chafe at new inconveniences at the Dedham Hilton. So, all in all, a nice, but somewhat bittersweet, holiday.